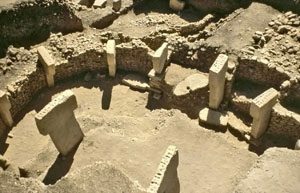 By around 10,000 BC, people in West Asia were beginning to settle down in one place instead of traveling around, even though they were still hunting and gathering and fishing. Probably this was because the end of the Ice Age was making West Asia so warm and wet and fertile that people didn’t need to travel around in order to get enough food anymore. They could just find enough food right where they were. Once they were settled down, some of these people, called the Natufians (nah-TOOF-ee-uns), began to farm a little, but in a simple way. They had tame dogs. They traded with other villages for obsidian, jewels, and salt. They built stone temples for their gods. This might be the time that the Bible remembers as the Garden of Eden. But then the climate got a little colder and drier again, around 8000 BC, and there wasn’t enough food anymore. Some people went back to traveling around to get food. Other people began to put more work into farming wheat and barley, to raise enough food. These people didn’t get as good food as the hunter-gatherers, but they could feed more people. With more people, they could defeat their neighbors and get more power. But in order to have more people, women had to have more babies, and spend more time caring for them. Meanwhile, men spent more time fighting their neighbors. Little by little, women began to lose power, while men gained it. People began to build larger towns about this time. 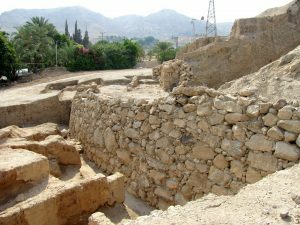 The oldest village that we know of, where archaeologists have dug up the houses people lived in, is at Jericho along the Jordan river in modern Palestine. It dates to about 9000 BC. By 8000 BC, about 2000 people lived there, in small round houses made of mud-brick, and they made clay masks, painted white, to remember people when they died. They began to use number tokens. They built a wall around their village to keep out animals and other people; their wall was twelve feet (3.6 meters) high and almost ten feet (3 meters) thick! Another old village is at Catal Huyuk (pronounced cha-tal-hoo-YUK), in Turkey. People built Catal Huyuk around 8000 BC, because it was near a good source of obsidian, and the people of Catal Huyuk got rich selling obsidian to their neighbors. It was much bigger than Jericho. Why was obsidian so valuable? Probably by around 6000 BC, 6000 people lived in Catal Huyuk. These people knew how to spin and weave cloth. They had learned to make pottery, probably from Central Asian people. They built mud-brick houses that you got into by climbing wooden ladders into the windows or into a trapdoor in the roof. The people of Catal Huyuk showed off their wealth by building a big mud-brick temple for their gods, which they decorated with the heads of bulls and also with images of a young goddess, a mother goddess, and an old goddess, representing the three stages of life. At Jarmo in Iraq, further east, there was a village starting about 7000 BC. It had a stone wall and a stone watchtower, forty feet (12 meters) high! This is another sign that the area was becoming more crowded, and that farming and war were becoming more important. People were beginning to fight each other over land, and so people had to defend the land they had with walls and watchtowers and stone-tipped spears. 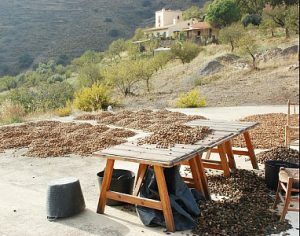 By the time of these villages, West Asian farmers were also growing a lot of different crops including, for example, figs, almonds, lentils, apples, and opium. Really, they were growing opium? Mesopotamia Before History, by Petr Charvat (revised edition 2002). Jericho: Dreams, Ruins, Phantoms, by Robert Ruby (1995). A reporter’s lively and readable account of the history of Jericho. Cite this page: Carr, K.E. 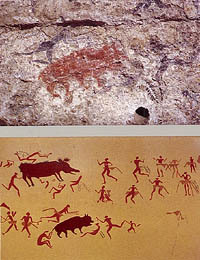 West Asia in the Stone Age. Quatr.us Study Guides, September 14, 2017. Web. April 18, 2019.